Yes, they can look stiff and formal. But I like glads because they remind me of our mother. 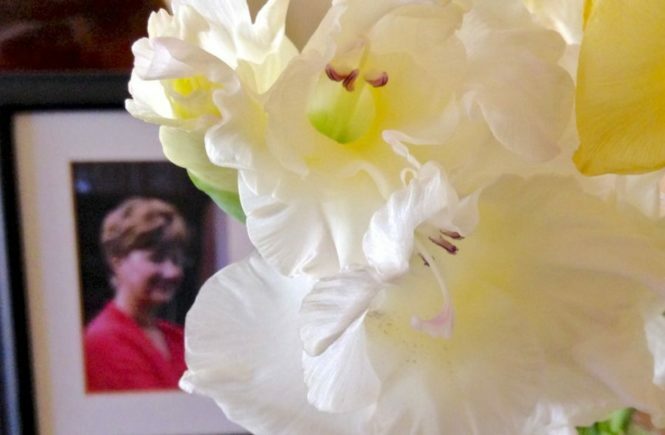 Not only because Gladiolus is August’s birthday flower, and August 31st – today – was her birthday. 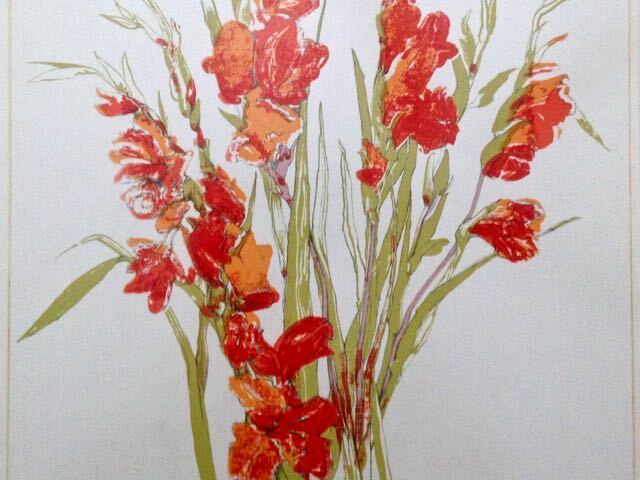 It’s because of a piece of art she made, a print of some coral-coloured gladioli. Both our parents were gifted artists. Both were art-school medallists in painting (he) and textile design (she) who, for so many reasons, never made full use of their talents. But after a lifetime of waitressing and sales-clerking jobs, our mum went back to school at George Brown College to update her printmaking skills. Sadly, she died shortly afterwards, at age 57. In fact, this year is the 30th anniversary of her very last birthday. 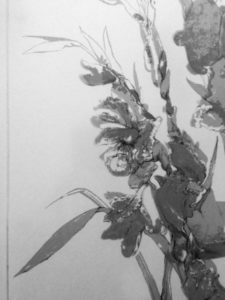 She left us with a portfolio case of her final works, including these glads. 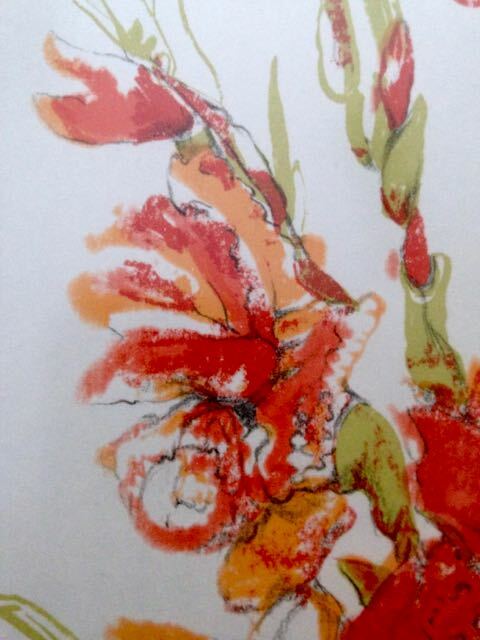 A detail of our mother’s print. Please excuse my bad iPhone photo, which doesn’t do it justice. There were enough copies of this print for us to share with our mother’s siblings after she died. 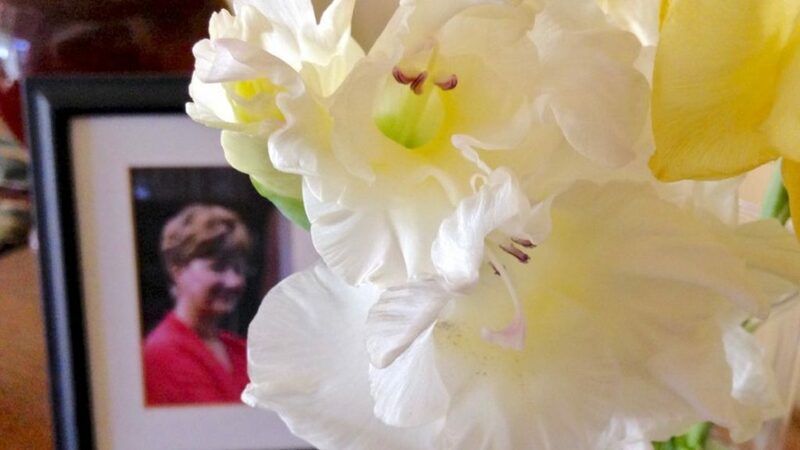 She’d be pleased with the glads in my opening shot, which I grew myself – for the second year running. The original bag was 50% off at the Toronto Botanical Garden shop in summer 2015. It was a dwarf variety, perfect for my small garden, in an elegant mix of white, cream and soft yellow. What the heck, I gave them a try. In spring, after all danger of frost, the larger ones were planted in the Microgarden. Others looked too small. But, what the heck, I planted them anyway, about 4-6″ (10-15 cm) apart in a medium-sized container, to fatten up. Guess what, almost every corm produced a flower. Thanks to the size differences, I’m getting a small bouquet every few days. There’s much to be said for what-the-heck. 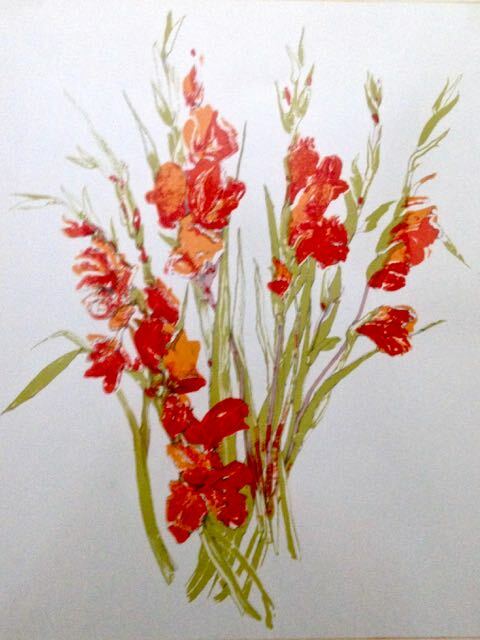 Purchased bouquets of glads, like the tall ones in my mother’s print, look best in multiples. Two bunches is good. Three is even better. That moves flowers from stiff and formal to something voluptuous. The ones in the print look like two big bunches at least. In fact, I think they might even have been a birthday gift to Mum from our dad’s sister, on our aunt’s first visit to Canada from the UK. His family never really forgave our mum for marrying our dad, so this meeting after nearly 30 years was momentous. 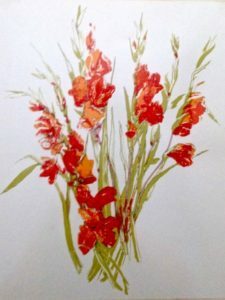 A symbolic gift perhaps, as the word Gladiolus comes from the Latin word for sword. I guess it was a laying down of arms, of sorts. And in our mother’s picture of it, the swordlike stems are loosely scattered, their tips as sharp as pen nibs, but lightly rendered almost to invisibility. What a lovely tribute to your dear mom. It’s obvious where you gained your magnificent artistry, in words and gardens. Aw, gee, Linda. 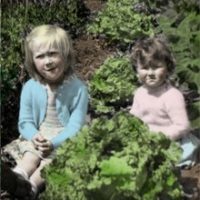 Thanks for your kind words (but you haven’t seen my garden)! Beautiful artwork. So glad you have some copies of both the glads and the artwork. Your mom was so young, sorry for your loss. Thanks, Janet. Yes, 57 was too young to die – and sounds younger and younger as I grow older myself. 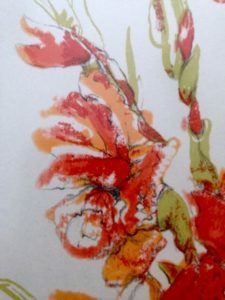 Especially when the missing person has created things, whether a hooked rug (my aunt) or a recipe for mushroom pickles (my Mum’s own father) or a gladiolus print, a little of them lives on with the people who loved them. Your mother’s glads are lovely, both in her artistic interpretations and your descriptions of her actual plants. Thanks for sharing this wonderful remembrance. What a beautiful tribute to your mom. And now it’s clear where all your creativity comes from. Nice to see you here, Barb, and thanks for your comment! Lovely print and lovely words. Very kind, Jessica, thank you. Your mother was very talented. I do love her print. I grow glads also, but leave them in over winter and they return and multiply each year. I don’t have the small variety like you though. That is a beaitiful first shot, they way you framed the portrait behind. Thank you, Donna. One corm that I missed digging up did overwinter this year. But 2015/16 was a very mild winter in Toronto, and while the corm produced leaves, it didn’t make a flower. Or hasn’t yet… who knows. There are some hardier gladiolus corms, I’ve heard. I believe they’re closer to the true species. Because my garden is part-shade, I hadn’t considered growing glads till I saw that ‘what the heck’ package on sale. Now, I think I’ll try re/planting them every year. I’ve really enjoyed having my micro cutting garden.